December weather in Atlanta has been odd. Well, odder than usual. The first part of the month was quite warm. It felt like spring. One day nearly reached 80 degrees. Then it turned cold, back to warm, and back cold again. I was flip-flopping between craving fresh berries and comfort food. What to do? Combine the two with Strawberry Risotto. Where to get fresh strawberries in Georgia in winter? Luckily it just so happens to be prime season for Florida strawberries. All I have to do is go to my local grocery store. There I will find berries picked from Florida Strawberry Growers Association farms in the produce section. Strawberry Risotto is a savory dish. It may not sound that way. Yet anything made with onion, garlic, pepper, wine, vegetable broth, and olive oil has to be savory. It is a classic Italian dish called Risotto alle Fragole and served as either a first or main course. Strawberries are a great source of nutrition. The vitamin C in them is especially great in winter. It’s a good thing to have anti-oxidants in your system to fight off colds and flu. Only eight medium strawberries can provide the daily requirement. For more strawberry nutrition information go here: 10 Reasons To Eat Strawberries. Real risotto takes time and effort. Be ready to stand and stir for a while. The type of rice to use in critical. You need arborio or carnaroli as both are short grain and have a natural starch. Stirring releases the starch and is what makes it creamy. Once you have tasted real risotto you will know the difference. Everything else, all the cheater methods, are only rice with sauce. How about more strawberry recipes? Oh yes! All you have to do is scroll down to find a list of them. The Sunday Supper Movement is proud to partner with the Florida Strawberry Growers Association to share some summer sunshine in the dead of winter. You can also bring in a little cheers by making either a Strawberry Martini or German Strawberry Wine Punch (Erdbeerbowle). 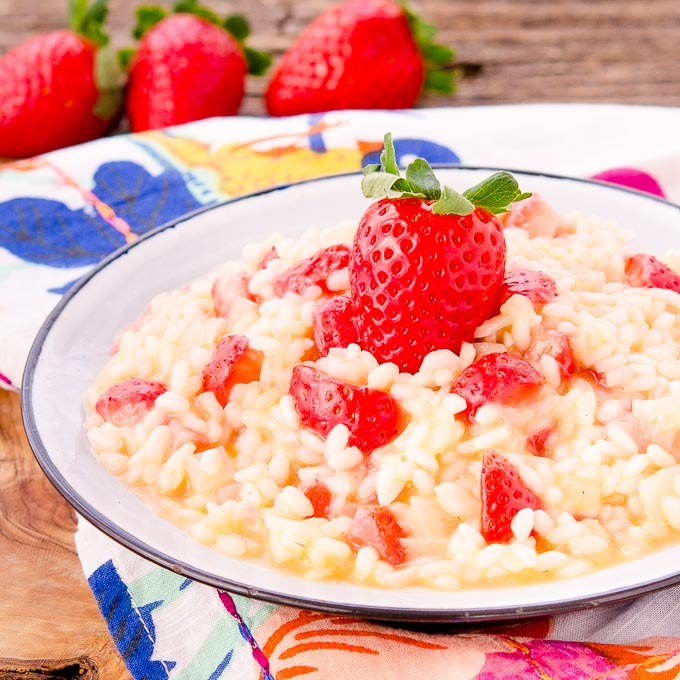 Strawberry Risotto (Risotto alle Fragole) is a savory rice dish made with strawberries. It's comfort food to brighten up a cold winter day. Heat olive oil and 1 tablespoon butter in a heavy bottom sauté pan over medium heat. Add onion and cook until softened and opaque, stirring occasionally, about 5 minutes. Add garlic and pepper, stir, and cook until fragrant, about 1 minute. Add rice and stir to combine. Continue stirring and cooking until the edges of the rice are translucent and the center is still opaque, about 2 minutes. Add wine and stir to combine. Cook until the rice absorbs the wine, stirring constantly. Add warm broth, a ladle at a time, stirring after each addition and constantly stirring while cooking. Wait to add each ladle of broth until the rice has almost soaked up the last addition. Test the rice after you have added about 3 cups of broth to see if it is done. It should be al dente, with just a bit of chew to it and not completely soft or mushy. Note the risotto will not taste fully seasoned at this point. It will get saltiness from the parmesan cheese. The risotto is ready when it is similar to a thick porridge and has a creamy consistency. Add one more ladle of broth, remaining 2 tablespoons butter, and parmesan cheese. Stir to combine and keep stirring until butter and cheese has melted. Gently stir in strawberries. Serve immediately. 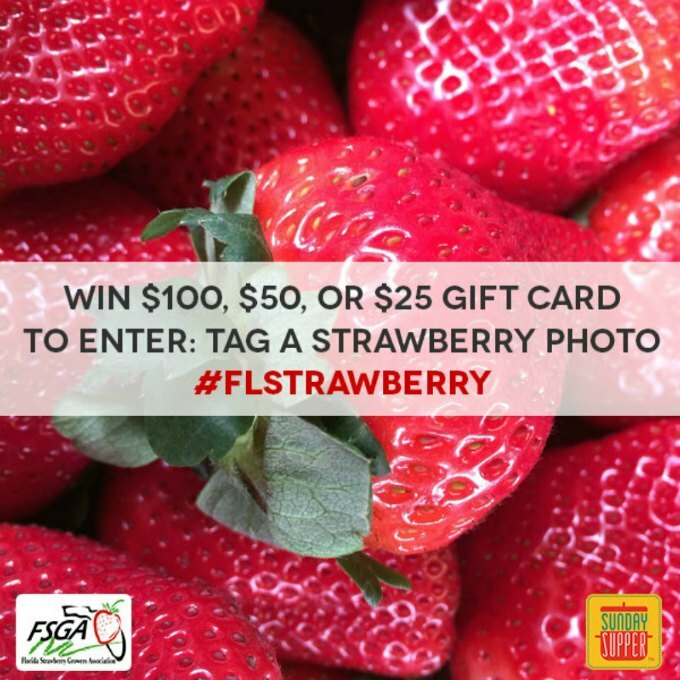 Disclosure: This post is sponsored by Florida Strawberry Growers Association in conjunction with a social media campaign through Sunday Supper LLC. All opinions are my own. Oh my yumminess! I have heard how wonderful Strawberry Risotto is, but I’ve never had the pleasure of trying it. I’m so glad you shared this recipe, so I can give it a go! Thanks! this looks so good! 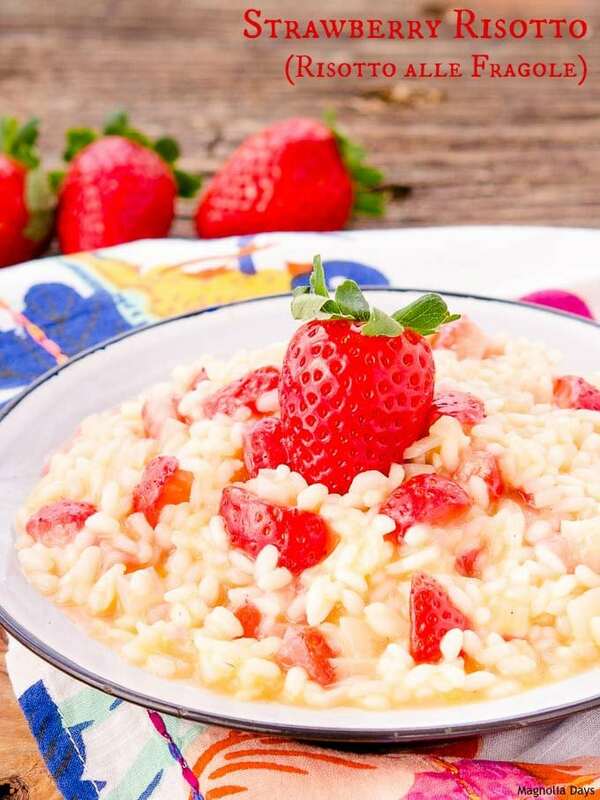 I love risotto, the strawberries are a creative twist on a classic dish. 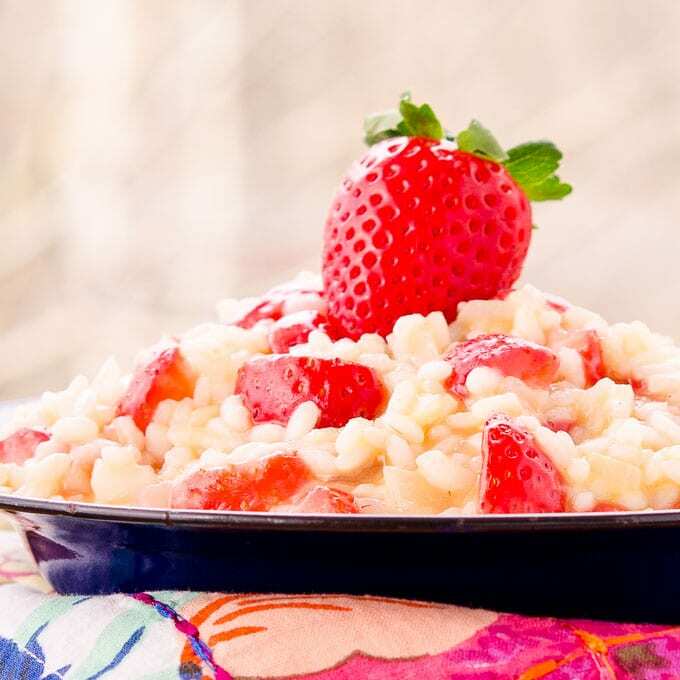 We saved the best for last in today’s roundup – I seriously cannot wait to try this Strawberry Risotto – looks SO good! What an interesting combination of flavors. 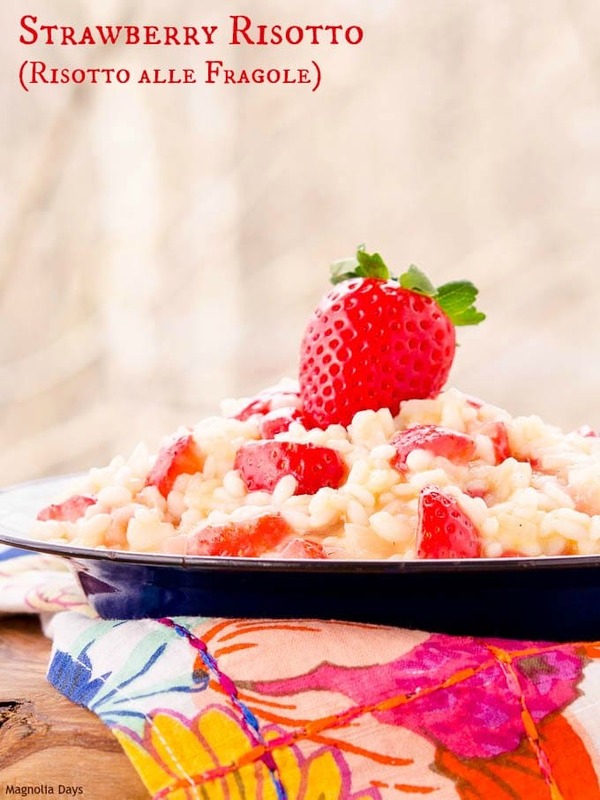 I wouldn’t have thought to add strawberries to risotto but it sounds great! We have had the oddest weather for NYS also. We were in the 70’s for Christmas Day! I love how you combined the savory (and salty parm!) with the sweet strawberries in this dish. It sounds wonderful! I’ll eat this dish anytime of year! I have been growing more fond of risotto of late. I’d never heard of this variation, but it sounds delicious! I can only imagine how flipping amazing this risotto must taste! Risotto is one of my absolute favorite Italian dishes — never in a million years would I think to add strawberries. Sounds really tasty, and so creative! I just made risotto for the holidays and can’t wait to make this recipe to test out your method! I’m sure it’s fantastic!